Alexis-Simon Belle was the most prominent portrait painter at the Jacobite court in exile at Saint-Germain-en-Laye. This portrait of James VIII and III, dating from the early eighteenth century, shows James in the armour of a French military commander threatening Dover Castle from the coast of France. 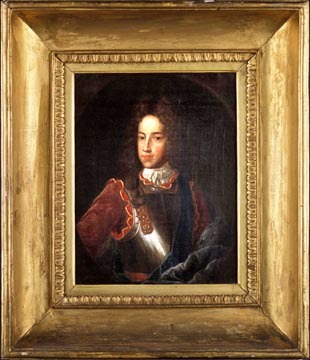 It relates to Belle's portrait of James now at the Blairs Museum, near Aberdeen. Demand for versions of this portrait amongst prominent Jacobites was so strong that Belle had to take on several assistants in order to meet it.